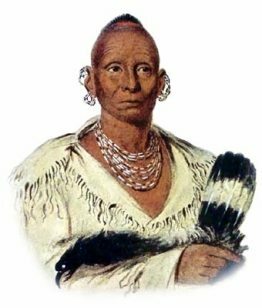 This article contains facts and information about the life and times of the famous Native American Indian chief known as Black Hawk. Black Hawk may have been born into one of the regular families within the Thunder Clan of the Sauk. The two small nations of the Sauk tribe and the Fox tribe had lived as one family for a long time and shared the Algonquian language. Their lands stretched from the northern Great Lakes to the Mississippi River, and down to Illinois and Iowa. Their number was not more than six thousand. Black Hawk was born at Saukenuk which was the principal Sauk city located just along the Rock River. His father’s name was Py-e-sa, a respected medicine man. For additional facts and information refer to the legend and the Story of Black Hawk and the Story of the Black Hawk War. Black Hawk! Discover the vast selection of pictures on the subject of the tribes of Famous Native Americans such as Black Hawk. The pictures show the clothing, war paint, weapons and decorations of various Native Indian tribes, such as the Sauk tribe of Black Hawk, that can be used as a really useful educational resource for kids and children of all ages studying famous Native Americans such as Black Hawk. We hope you enjoy watching the video - just click and play - a great educational resource for kids.